Understanding the business value of combining all modes of communications including telephony, e-mail, instant messaging, presence, and conferencing functions is easy. Unified Communications (UC) transforms the workplace, making it more productive, efficient and effective. While identifying the value is easy; planning, implementing, and managing the integration of these solutions can be very complex and costly. Many, even larger, organizations lack the in-house expertise to achieve their UC strategy, or simply find the upfront capital expense too great. This has many companies looking at unified communications as a service (UCaaS), hosted by a service provider to help get them there. Hosted UC service providers remotely deliver and manage various communications services using shared resources enabling customers to consolidate and outsource much, or possibly all, of their communications and collaboration needs for a fixed, predictable, monthly cost. Unlike on-premise solutions, hosted UC solutions require no hardware to provision, no software to buy, install or configure, and no expensive training for in-house support staff. This alleviates nearly all of the obstacles that organizations have historically faced when evaluating a UC implementation, and allows them to get to the core business benefits – without the pain that might otherwise exist to get there. 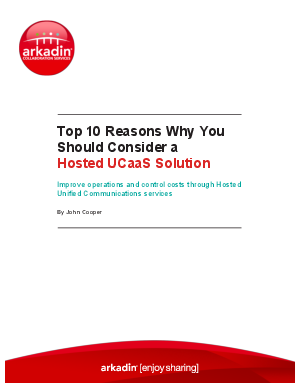 Hosted UCaaS provides 10 main business benefits over on-premise solutions, this whitepaper details these top 10 reasons.